« Space X’s Dragon Successfully Completed the Delivery Mission! Did you drive or fly to one of the cities along the route for observing total solar eclipse? Did you avoid the crowd by watching live stream for the event, or were you simply oblivious of the Total Solar Eclipse event today? 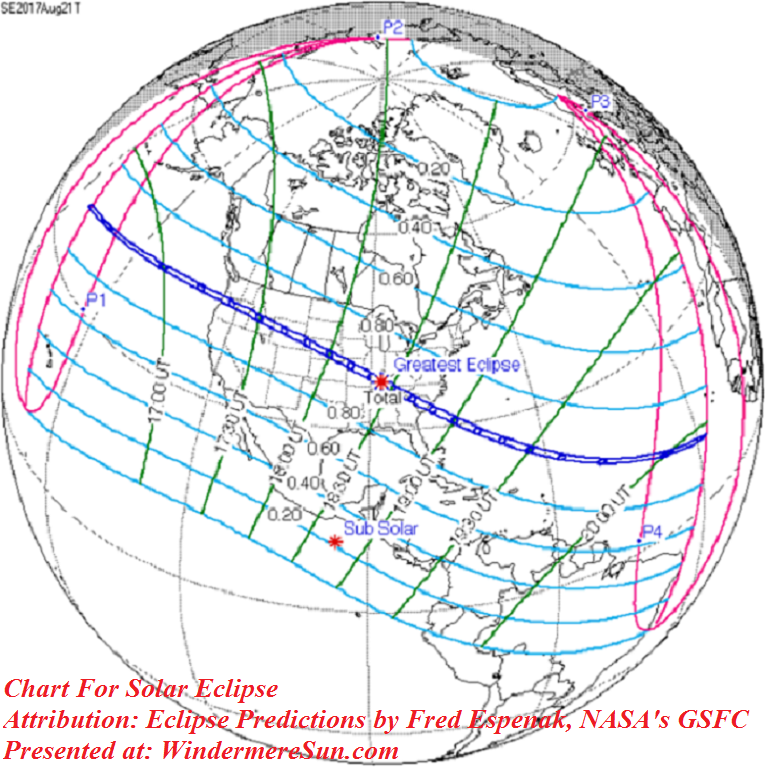 There were so many people trying to reserve for flights to one of the cities along the route of total solar eclipse above that a coach plane ticket between DFW (Dallas Fort Worth) to Nashville costed $6000 last week. Hotel rooms were quickly running out that all of the hotel rooms along this route were fully booked last week that the last single room was going for $6000 for 4 nights at Oregon State University area. This is the only reason that I am reporting the event from Florida rather than Oregon State University today. 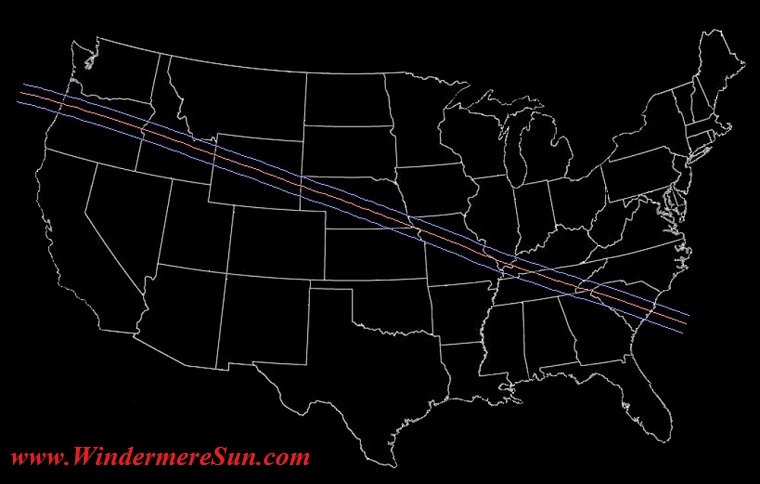 The next total solar eclipse in the USA will be on April 8, 2024, only 2422 days away. The next total solar eclipse outside of the USA will be on July 2, 2019, with the path of totality running through South American countries such as Chile and Argentina, according to NASA. If you missed today’s event, perhaps you’ll be interested in one of these two future events. October 22, 2134 B.C. : one of the earliest recorded solar eclipse appeared in Shu Ching, an ancient Chinese book of documents. The ancient Chinese believed that a solar eclipse was the result of a large dragon eating the Sun. It was the job of two royal astronomers Hsi and Ho to predict such events so that people could prepare bows and arrows to fend off the dragon. But Hsi and Ho shirked their duties and got drunk, so they were beheaded by the emperor. May 28, 585 B.C. : A total solar eclipse brought about an unexpected ceasefire between two warring nations, the Lydians and the Medes, fighting for control of Anatolia (modern day Turkey) for five years, according to ancient Greek historian Herodotus. During the Battle of Halys, aka Battle of the Eclipse, the sky suddenly turned dark as the sun disappeared behind the moon. Interpreting this inexplicable phenomenon as a sign that the gods wanted the conflict to end, the soldiers put down their weapon and negotiated for a truce. 29-32 A.D.: Christian gospels say the sky darkened after the crucifixion of Jesus. It is possible that the event may have coincided with a solar eclipse. Historians have tried to pinpoint the death of Jesus, using astronomical records of solar eclipse in the years 29 C.E. or 32 C.E. May 5, 840: Louis the Pious, the third son of Charlemagne, inherited a vast empire in what is modern day France after his father died in 814. His reign was marked by dynastic crisis and rivalry between his sons. Being a deeply religious man, Louis became terrified of punishment from God after witnessing a solar eclipse. According to the legend, he died of fright shortly afterward. May 29, 1919: Sir Arthur Eddington tested Albert Einstein’s theory of general relativity during a total solar eclipse. Einstein had theorized that massive objects caused distortions in space and time. Eddington confirmed that starlight bent around the sun by measuring the position of certain stars relative to the eclipse. How many of you had “observing a Total Solar Eclipse” on your bucket list? 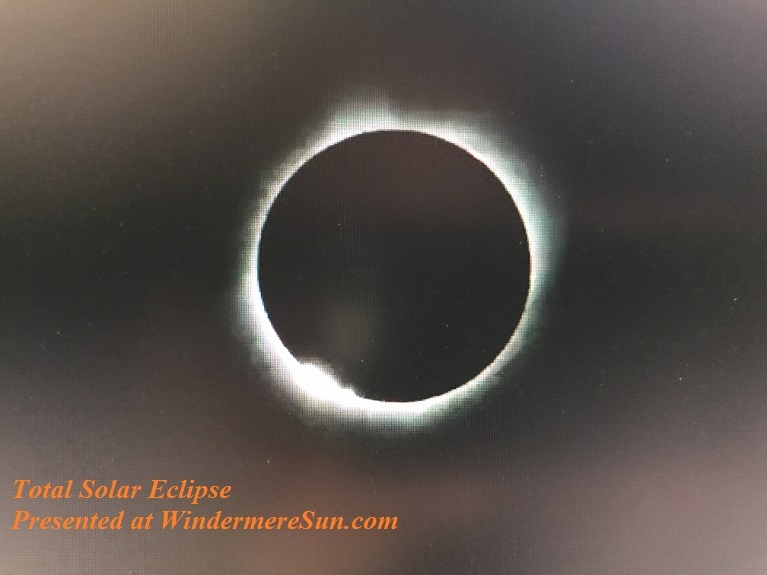 It was in totality only within a band across the entire contiguous United States ( covering: Oregon, Idaho, Montana, Wyoming, Nebraska, Kansas, Iowa, Missouri, Illinois, Kentucky, Tennessee, Georgia, North Carolina, South Carolina). The last time a total solar eclipse was visible across the entire contiguous United States was during the June 8, 1918 eclipse. Two spectacular events signal the boundaries of totality: appearance of the diamond effect and Baily’s beads. 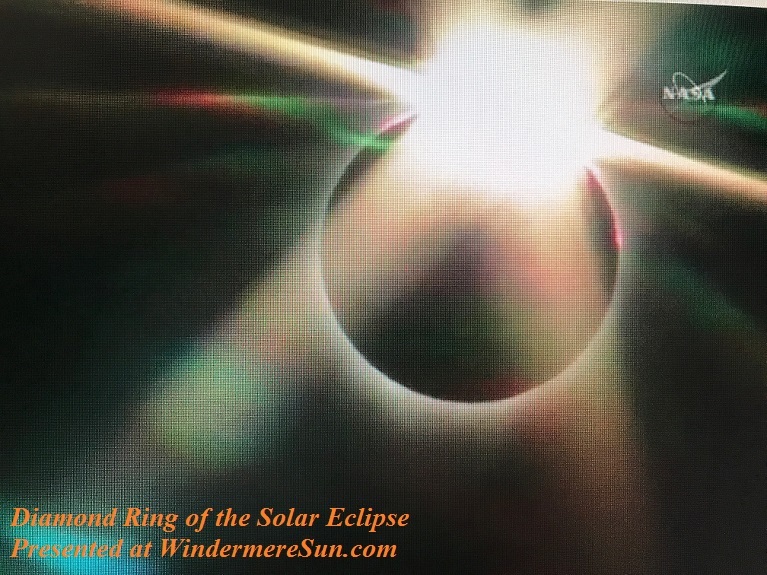 Diamond Ring: it is a product of the final moments of the pre-totality partial phases and their post-totality resurgence. Baily’s Beads: Sir Edmund Halley is credited with observing the first Baily’s beads during the eclipse of April 22, 1715. They were also observed by Maclaurin from Edinburgh during the annular eclipse of March 1, 1737 and by Williams from Revolutionary War America on October 27, 1780 from just outside of the totality. 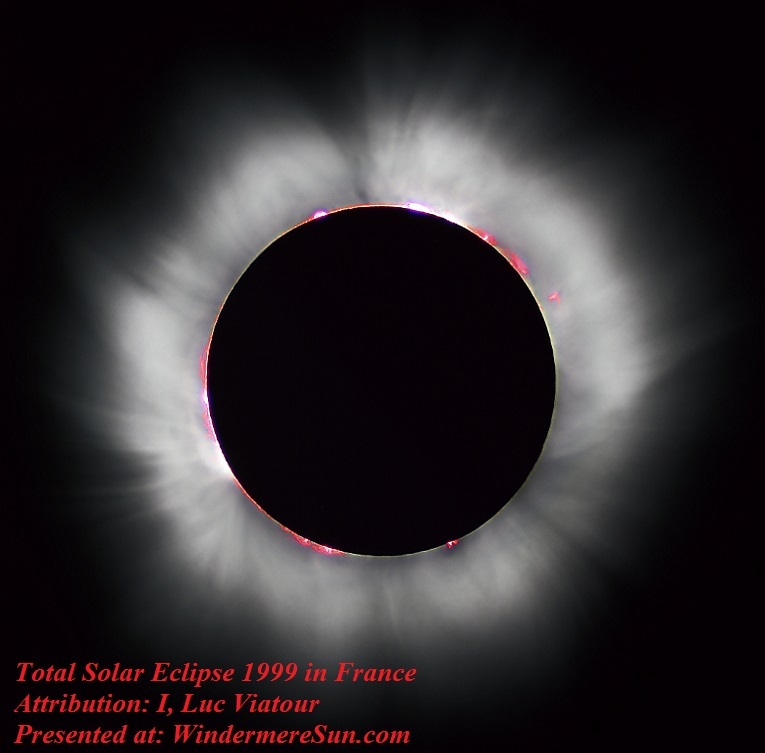 But it was Francis Baily’s widely disseminated description of the phenomenon during the annular eclipse of May 15, 1836, that led to their bearing his name thereafter. It was explained by Baily that shortly before second contact of a total eclipse, the opposing horns of the slender crescent sun begin to converge on one another. At the same time, the tenuous solar atmosphere becomes visible against the darkening sky, shining out around the edge of the moon where the sun has already been covered. The combination of this “ring” of light and the single brilliant “diamond” of sunlight where the horns are converging creates a most striking appearance, the diamond ring. The effect lasts for a very short time. 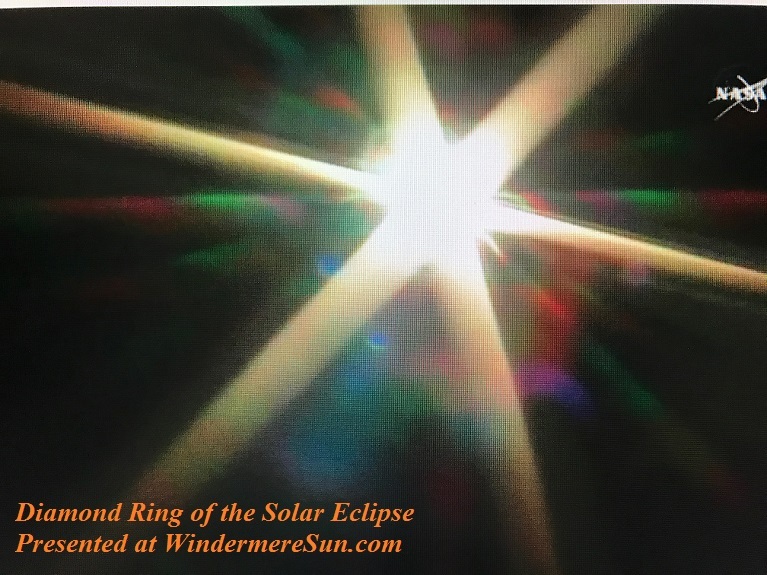 Soon the horns of the solar crescent close completely, and the diamond ring begins to break up, to be replaced by an array of brilliant beads of sunlight caused by the sun shining through valleys and depressions on the moon’s leading limb. This entry was posted on Tuesday, August 22nd, 2017 at 6:20 PM	and is filed under Business & Opprotunity, Educational, Events, News. You can follow any responses to this entry through the RSS 2.0 feed. You can leave a response, or trackback from your own site. Hey! This is my first comment here so I just wanted to give a quick shout out and tell you I truly enjoy reading your posts. Can you recommend any other blogs/websites/forums that go over the same topics? Thanks for your time!